This picture is not only very fitting when it comes to the current weather situation, since today was all rainy and gloomy. It also showcases remarkable tailoring, beautiful fabrics and a thoughtful details. For example, I like the idea of two different kind of scarves tied around the neck. It does not appear so much as the result of a helpless moment of indecision, but much more like a thoughtful act when preparing oneself for the outside world (and probably weather). 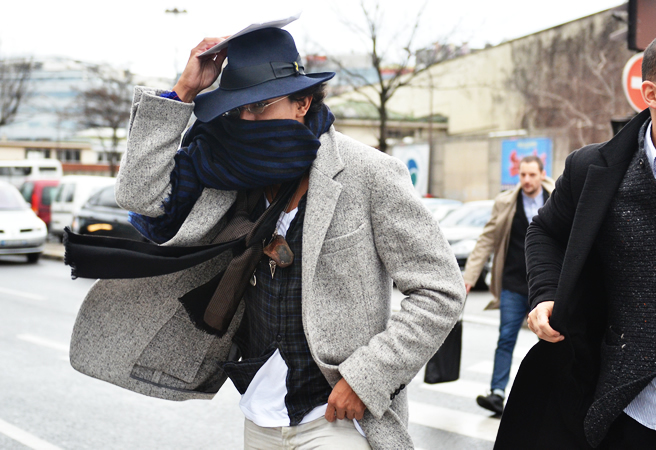 Maybe I should add that the person in question here, is Haider Ackermann. A fashion designer not dressed entirely in black. Maybe that’s enough of a surprise for today. Ackermann always looks so sharp!